Observant pedestrians on Mathews Street may have noticed an absence on campus since early summer. Halfway House, the little waiting station that has been a campus landmark since at least 1884, has been temporarily relocated because of construction at the Natural History Building. 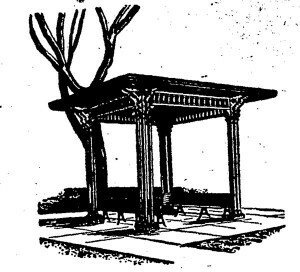 Halfway House illustration used in the Daily Illini in the 1960s. Originally, the landmark stood where the street car track turned into Wright Street, but there is little information about the structure during its early years. One of the earliest substantive references to the Halfway House on campus was an 1894 observation by the Daily Illini. “Although the street car company [Urbana and Champaign Electric Street Railway] has reaped abundant harvests from the pocket-books of the students and professors of the University, it has not deemed it necessary in the least to arrange for their comfort, having provided no protection from storms for persons waiting for the cars at the University stopping place.” In response, Trustees voted to reconstruct the Halfway House at the north entrance of the main grounds (now the front of the Illini Union). 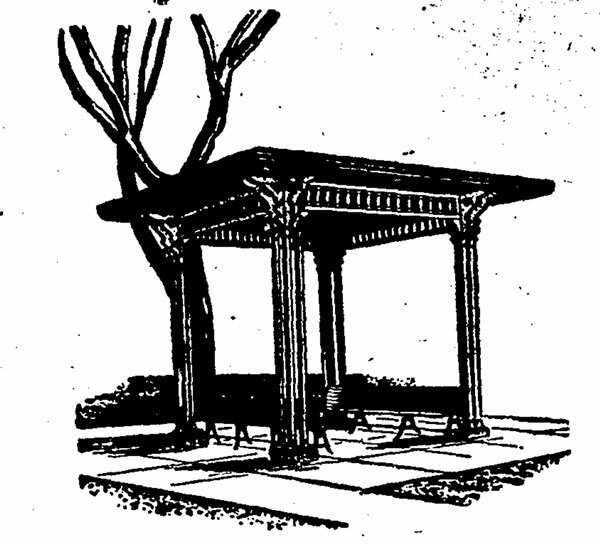 The railroad stopped service in 1908, but the shelter remained.